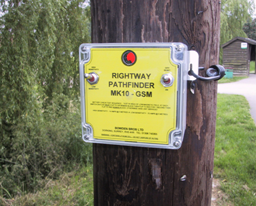 The Pathfinder MK10 is identical in terms of fault detection as the MK8, but has the added benefit of a GSM/GPRS module to report the alarm state remotely. As an instrument it has proved remarkably successful and useful when tracking down repetitive transient faults that keep on tripping a pole mounted recloser. A few MK10 instruments located downstream of the recloser can be left out on the network for some days, waiting for the fault, which as soon as the trip occurs, will report their alarm status and the fault engineer can react immediately to find the fault quickly. Communications can be to the fault engineer’s mobile telephone, or can be directed to a P.C. or laptop running data management software, which in itself can be linked to Control. A number of options exist for this to suit individual requirements. Very effective for tracking down repetitive transient faults. Can be moved to different locations to narrow the field of search for hard to find faults. 5 year battery life (for normal usage) from long life Lithium battery.